however the map isnt exactly what i originally wanted it to be (well with certain triggers at least) but i found an alternative that seems to make me happy enough to release it. Story: This area is the cliffie region between the Countries of Holixe and Asvetia. It is on the outskirts of some cities and also on the edge of an old battle field from an earlier war. 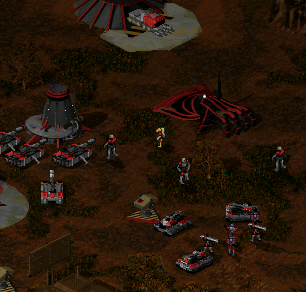 This area is slowly starting to be infected by tiberium but not yet devestated by it. EDIT: a cliff error was found at tibweb but i have fixed it. sorry about that to anyone. dont know how it got there but i guess it doesnt matter now that iv fixed it. updated to include the unit lighting thing. The only true freedom is the one you have won. yes i really liked the lighting on this one. it seemed very apocalyptic which i like. I love it! Seriously I really like this map, good job! anyone play it ingame yet and can give me a review? id like one. believe it or not i usually do about 1-2 hours every day for my SMMC map well......not every day but usually at least 3 days a week. and its probably now 70% finished and i have roughly about 2 weeks to complete it. and im sure i will. anyways im glad you guys like the map. once again thanks for the good replies. but has anyone played it ingame and can give me a good review of what i coulda done better maybe? i would really like some good criticism for once. in all truth im disappointed with the lack of attention in this area with the Raven's map and this one. oh well. ExtraUnitLight=.2	; Extra light to make units glow. ExtraInfantryLight=.2	; Extra light to make infantry glow. ExtraAircraftLight=.2	; Extra light to make aircraft glow. dude..set these to .0, PLEASE! those bright cyborgs kill the beauty of this map. They stick out like sore thumbs. Kill the bright! Looking very good, I like the mood you have set with the lighting, looks very nice, and judging by thr minimap it seems like usual you have payed good attention to map layour and detail, unfortunately I have not tested ingame, but I would put this forward to a spotlighting so far. i think i will make those changes Desu but right now im a bit busy so it will be updated tomorrow. i will also get a ingame pic showing units after i change that. so yeah expect an update sometime tomorrow. Well since i think Ixith is going to shoot someone if he doesn't get a full ingame review from someone, i decidided to test it ingame. The verdict? Most assuredly a solid and well done map. Lighting is nice during the day, but a bit dark at the deepest part of night IMO. Also, as desu said, the infantry/vehicles stick out a bit too much (though its not as bad ingame as the screenshots lead to believe). I did like the deep redness, and how well the green of the tiberium. The vehicles etc. add a nice ambiance to the map, and the detail is as solid as ever. The gameplay is challenging and fufilling. Overall a challenging and enjoyable map, and quite possibly worthy of a spotlight. lol i dont know.....it seems not many people be watchin the map forum lately. anyways i added the unit lighting thing but it doesnt change it too awful much.....i guess it is a lil better though.......within a minute of this post the 1st one will be updated with the change. And as usual, Ixith once again stuns us all with yet another incredible map. Nice job once again, my new favourite map. i dont think its one of my favorites of mine though. Congratulations! This map has been spotlighted! Ixith, I have a feeling that you'll be, again, the mapper with the highest amount of spotlighed maps in this year . This map is really awesome. An original map with the twilight ambiance an good modeling. I saw the constant return of the black frog of war, (undiscovred area) wich give an insteresting gamplay. The little funny thinh is the capturable civilian array, wich the trigger reveal the abandonned base area. While he continues to bump, he should at least be lucky that Ixith is still around. But...I don't find it that bad to bump a topic about a map/graphic if the author is at least still around. While he continues to bump, he should at least be lucky that Ixith is still around. I do agree with you Team Black because there's some nice maps lying around. But that doesn't mean we should start bumping a bunch of them. EDIT: Buuuuut, no complaints here. I never saw this, and I'm downloading it. It's also in the map pack. Have you downloaded it at all? The map pack? Unfortunately, no. I'd never have the time to sit down and play every single map.